Last week my friend Jim told me about an ancient Chinese proverb: “The best time to plant a tree was 30 years ago. 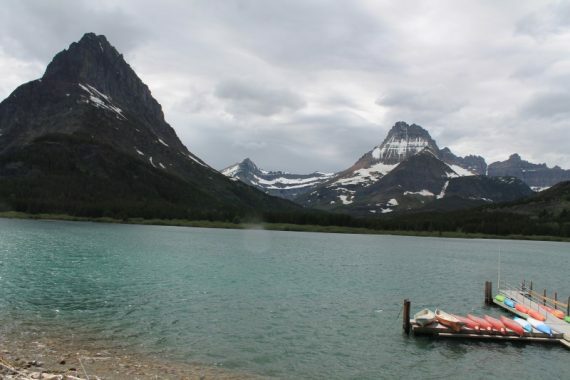 The second best time is today.” Back in 1910, Glacier National Park (GNP) had over 100 glaciers, and in 2015 there were only 26. 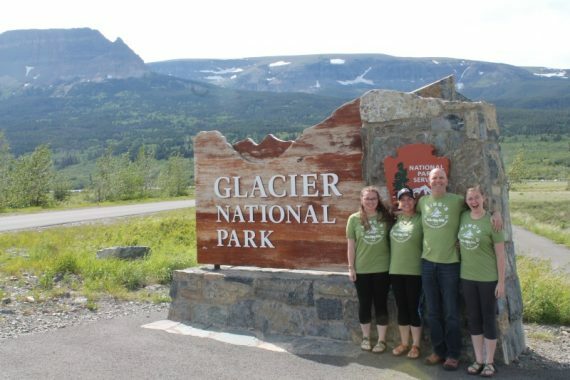 We can’t see 100 glaciers, but we’ll see what we can while we’re here. Preparation began before we left the house. Since we were going to see snow, Ellery wanted some “Elsa braids”. (That’s from Frozen, if you’re not hip.) That looked pretty cool, so Erin braided Marissa and Mallory’s hair, too. Thanks Erin! Not only was that super nice (and time consuming), but she did it on her and Scott’s anniversary. Congratulations Scott & Erin! 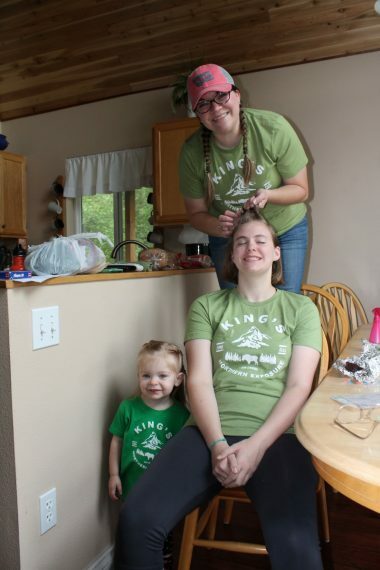 Marissa getting her Elsa braids from Erin, while Ellery looks on. Staying in a house on the west side of the park, near the Apgar entrance, we had quite a drive ahead of us in order to get to the visible glaciers (from the road) on the east side. I ended up putting 300 miles on our car today. 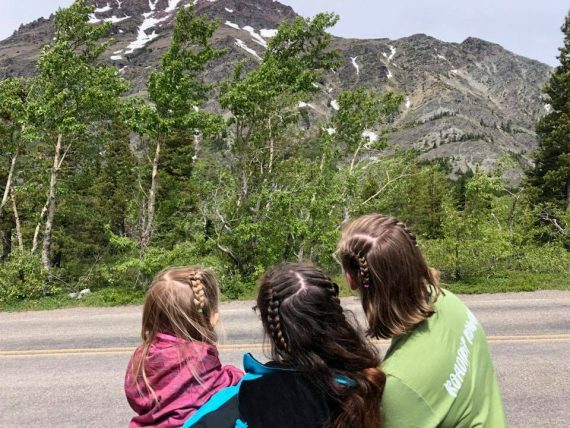 On our way to the east side, we stopped at Goat Lick Overlook south of GNP, which is a popular place for mountain goats to lick the rocks due to the mineral content in the water. We happened to catch just a few seconds of one goat before it went around the bend. With no goats to watch, we took pictures of each other. 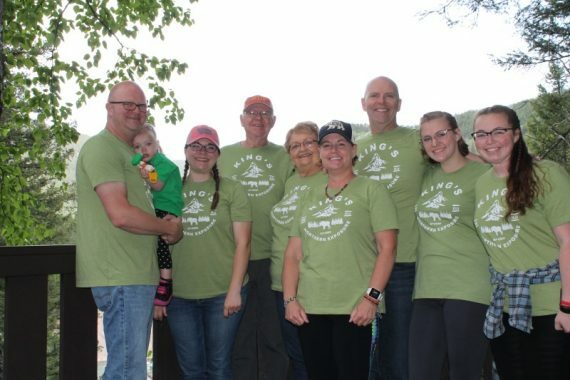 Vacation t-shirts at the Goat Lick Overlook! 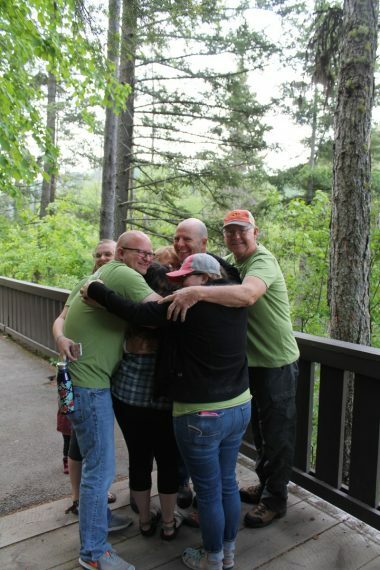 It was cool in our short sleeve t-shirts, so a group hug broke out. On to Two Medicine! We *needed* to stop here because yesterday our team that hiked Scenic Point found a snowdrift just off the road. Ellery has been talking about snow for months, so this was bound to be a highlight of her trip. But first, we visited the Gift Shop at Two Medicine. I think just about everybody bought something there. 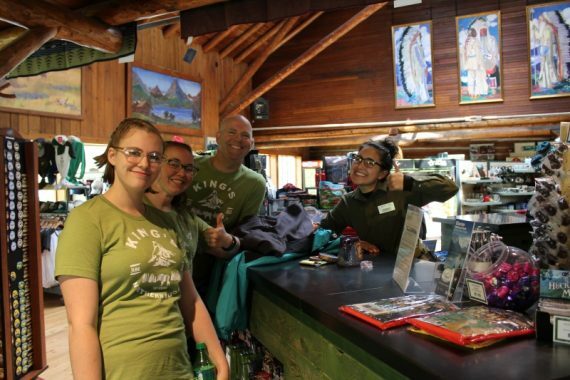 We give it two thumbs up for gift shop content. Yesterday, Mallory had found a coat she wanted there that had been marked down to $32. 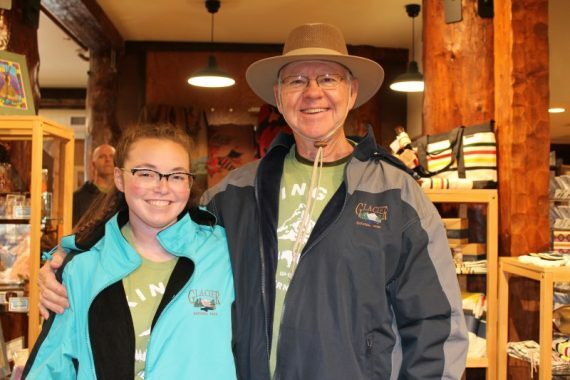 While she was carrying it around the store, she was approached by the Shuttle Bus Driver who was in the store waiting to take adventurers back to the town of East Glacier. Now it was time for snow. 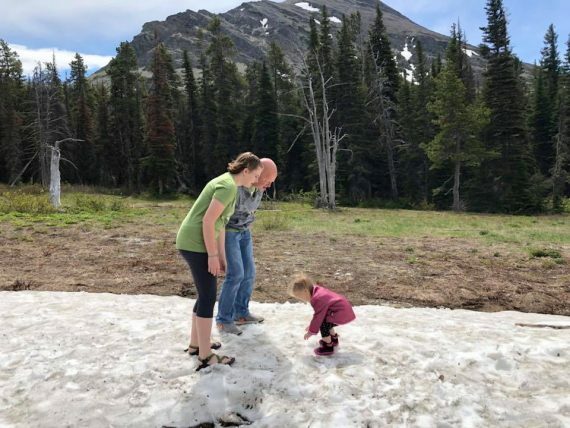 To everyone’s surprise, Ellery was not all-in on the snow from the start. She had to be coaxed for a while before she got the hang of it. Hey, we’re from Oklahoma and she had never played in snow before! 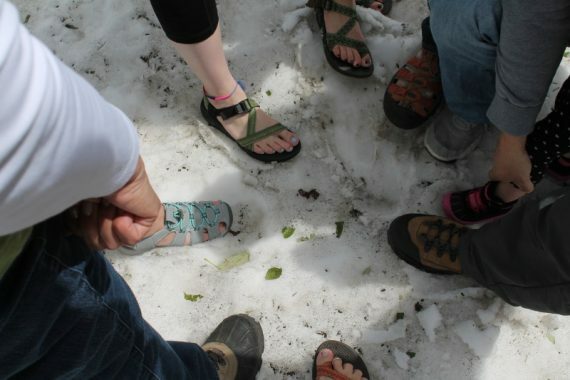 Everybody put their foot in the snow, even Ellery. 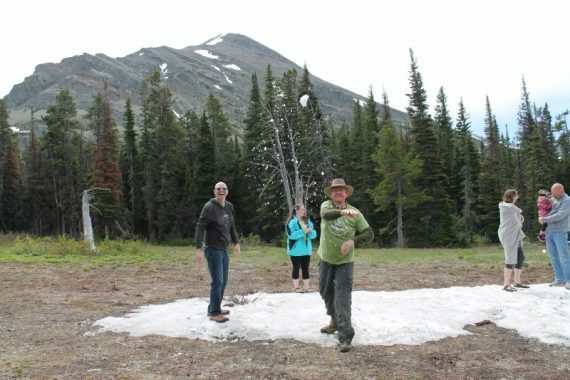 After the snow fun, we had a picnic lunch of meatloaf sandwiches before we hit the road to go check out some glaciers. There are three entrances to GNP on the east side. Two Medicine is the southernmost one, and our plan was to drive to the northernmost entrance, the Many Glacier entrance. In the months leading up to the trip, Stephanie thought we were saying “mini” glacier. But no, it is Many Glacier because there are many glaciers. There is some significant road construction happening on this road. We timed it pretty good, but I feel for the traffic in July on this road. While our car was parked waiting for it to be our turn to drive on the one-way traffic, there was a stray dog hanging out in the road checking out the cars. Scott, Erin, Ellery & PK had come this way before and had seem the same dog in the same place. I am now posting pictures of stray dogs in this blog. As we passed the flagman, he gave us the “Pistols Firing” signal, so we yelled “Go Pokes” at him. I guess he liked our license plate. 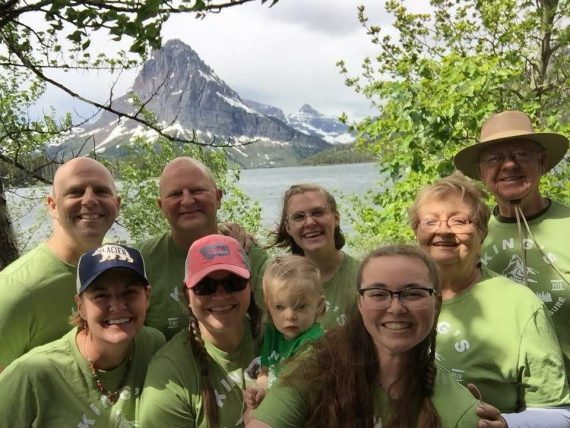 If you were to drive straight through from our house in Hungry Horse to Many Glacier, it would take over 3 hours. So it’s a drive. But if you had to pick a centerpiece for the park, it is probably here. 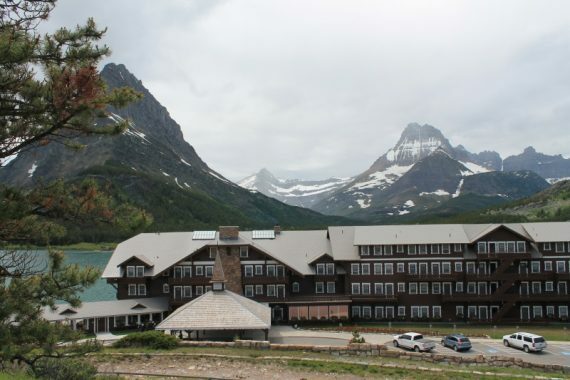 It is home to the Many Glacier Hotel plus many of the most scenic hikes. According to my Day Hikes trail map, 6 of the top 10 hikes are in this section of the park. 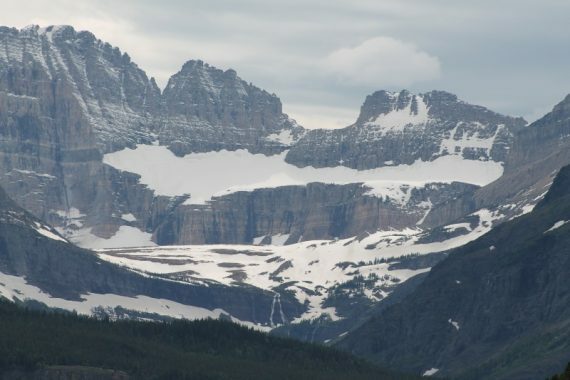 Plus, it is easy to see 3 different glaciers, which is what we’re here for. Glaciers! 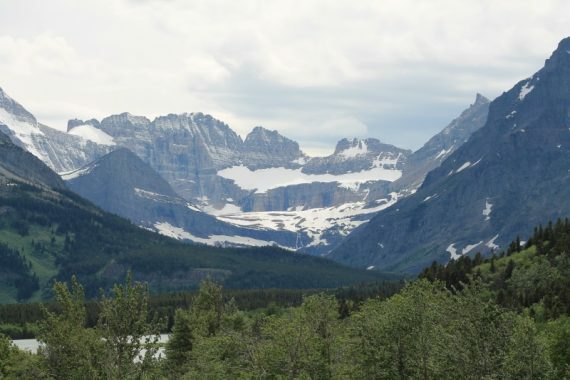 The Salamander, Gem, and Grinnell glaciers. The Salamander glacier is the long horizontal one that looks like a weasel. We visited the Many Glacier Hotel first. It opened in 1915 and has a Swiss alpine theme. 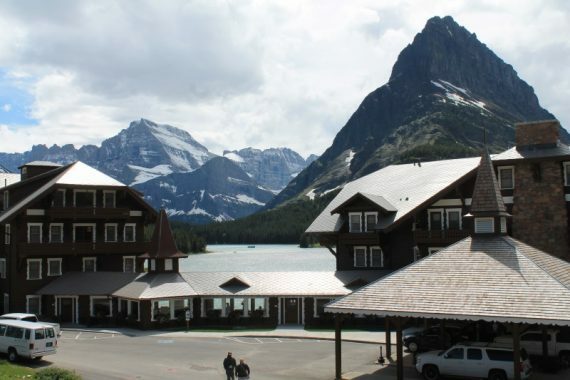 As you make the rounds of national parks, it is quite common for the hotels to have a European theme. Built back in the early 1900s, the promoters were trying to entice the (mostly eastern US) wealthy to skip Europe and “See America First”. The hotel appeared in excellent shape as we walked around and through it. And the views are first class! 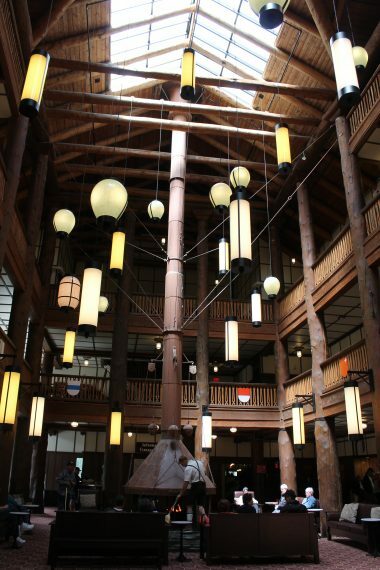 Interior of Many Glacier Hotel. 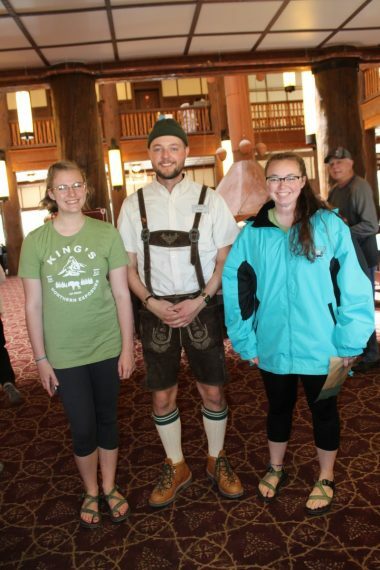 The fireplace is being serviced by lederhosen-wearing hotel staff. 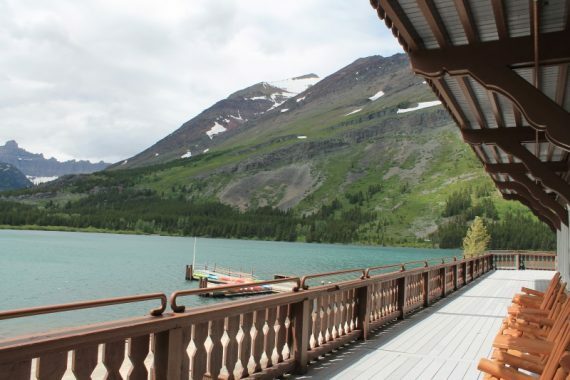 Back porch of hotel overlooking the lake. While down on the beach checking out the view, I made an offhand comment to Stephanie that next time we will stay here. There was a man standing near us that spoke right up, “The walls are paper thin. We could hear the mom in the next room reading her kids their bedtime story.” Good to know! KK bought himself a discount jacket just like Mallory! She is a trendsetter. Stephanie visited with the bellman, Tyler, who told us the hotel just opened last Friday. Wow. The hotel is only open for about 100 days each season. The bellman was from Oregon. When Steph told him we were from Tulsa, he said the head bellman, Wade, was from Oklahoma and it was Wade’s 16th season at the hotel. Not two hours later, after we had left the area, our friend from Tulsa, Brandon, independently had texted Stephanie and out of the blue said, “One of my best friends works at Glacier. 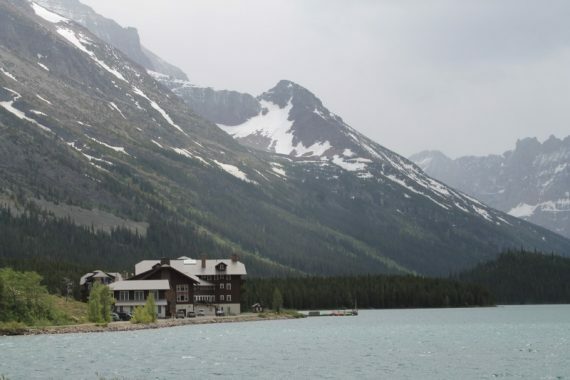 His name is Wade and is a bellman at the Many Glacier Hotel.” Wow! Yeah, it’s a small world. We made our way to the Swiftcurrent Motor Inn just down the road a short way, because we heard they had a sweatshirt that Marissa and Erin wanted, in their size. 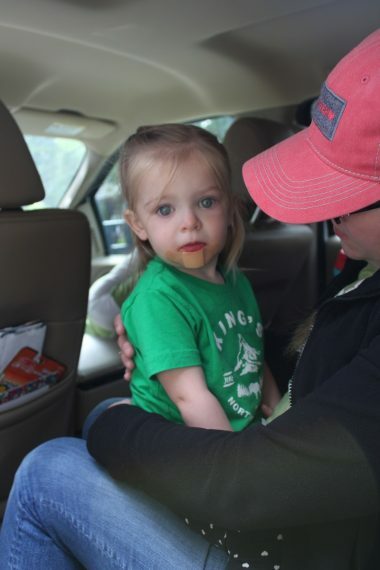 While we were there, Ellery fell flat on her face and busted her lip. It was an intense moment! Scott and Erin rushed her to the ranger station, which was the closest place for first aid. The rangers were very good with Ellery, but they were a little short on supplies. They did not have any children’s medicines. They tried to use some of their glucose strips a few days earlier, and they were 10 years old. 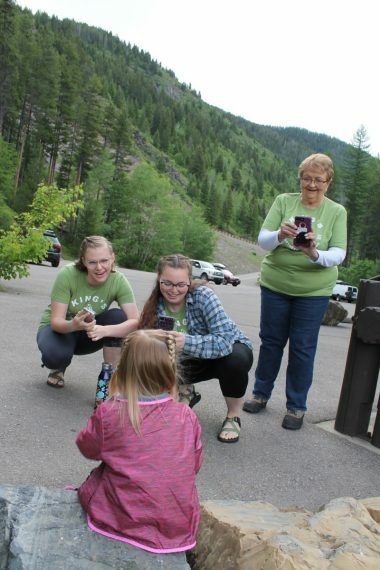 Scott, Erin, and PK left immediately with Ellery with the intention of taking her to the clinic in Kalispell, which was a LONG way off. The rangers thought she might need a few stitches. 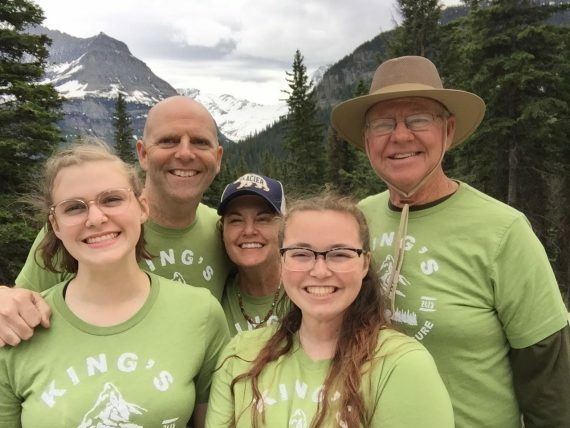 But on the drive over, Erin called her cousin, Gavin, an EMT, who advised that probably was not necessary, and they might not get there within the acceptable timeframe anyway. So they ended up stopping for ice cream, and then going on to the house. Ellery was a trooper and is doing great now! KK road with Stephanie, Mallory and Marissa, and we were going to visit the Going to the Sun Road at the St. Mary entrance. 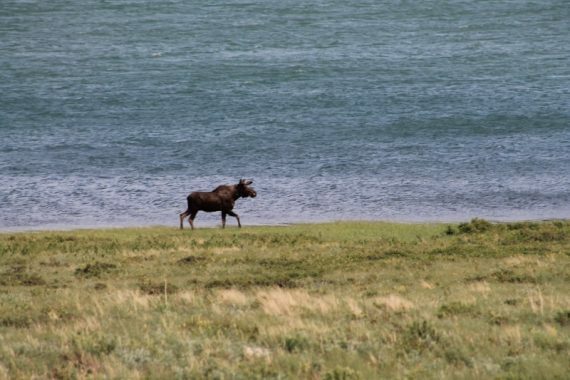 On our way out of the Many Glacier area, we noticed some cars pulled over on the road and a moose in the distance. Pull the car over! While we were looking at the moose, we saw that the other cars were facing the opposite way. 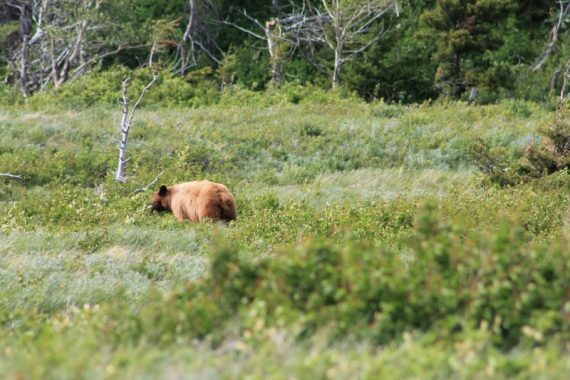 We looked over there and saw a grizzly bear. Wildlife Overload! 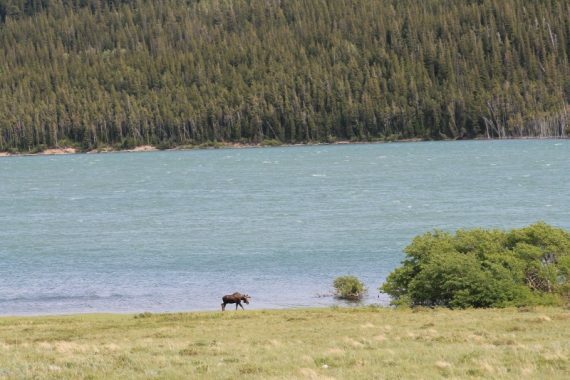 Ain’t no traffic jam like a moose and bear traffic jam. These cars are parked on the road taking pictures. We drove on down to the St Mary entrance to the park. The Visitor Center had closed moments before, so we went straight to the welcome sign for a picture. KK was taking our picture and a tourist walked up and asked KK if he wanted to be in the picture. KK said, “No, they’re all together”. This was hilarious because of course all five of us are wearing the exact same shirt. We had big smiles in that photo. 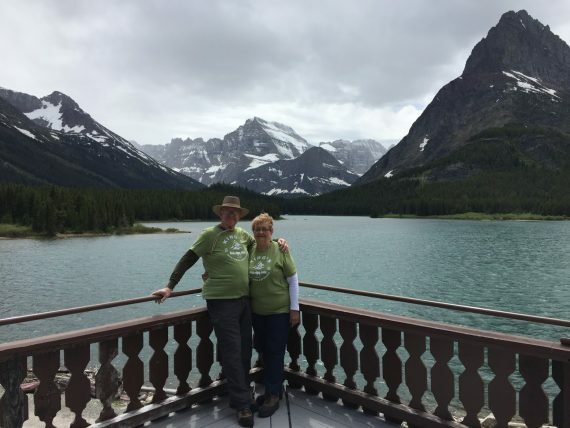 Welcome to Glacier – St. Mary entrance! 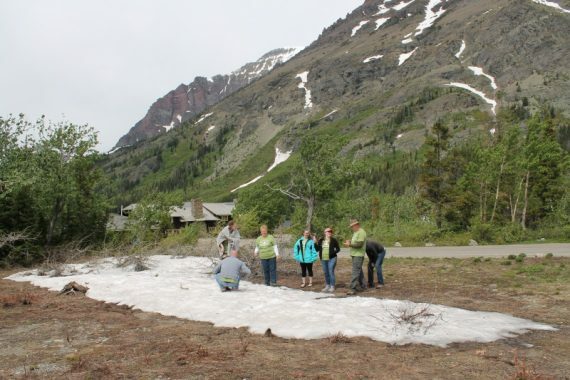 The Going to the Sun Road is only open about 13 miles, and from there it is closed due to snow covering the road. The views were amazing. It was nice that the road was not super crowded. We are giving up some opportunities for various hikes and scenic drives, but we are making up for it with relatively small crowds. 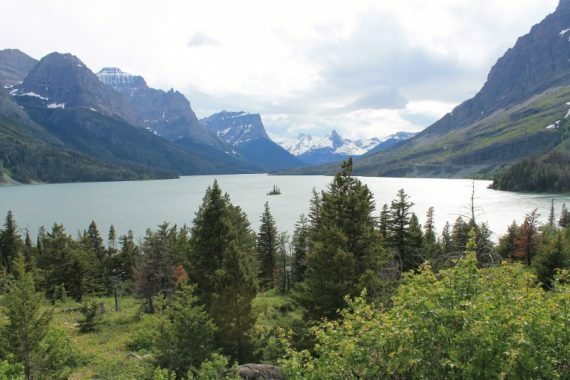 Wild Goose Island at Saint Mary Lake. Standing in front of Jackson Glacier. The road was closed right at the pull-off to see Jackson Glacier. You could still hike and bike up the road if you wanted, but no cars allowed past that point. We left Going to the Sun Road and began our trek back to Hungry Horse. We did take time to stop in East Glacier and get some ice cream. Huckleberry, of course. Continuing on back to the house, we found a memorial marker to commemorate the finding of the Marias Pass. We had driven past this area several times and this was the first time we saw this gigantic obelisk. We had always been looking at the mountains on the other side of the road. 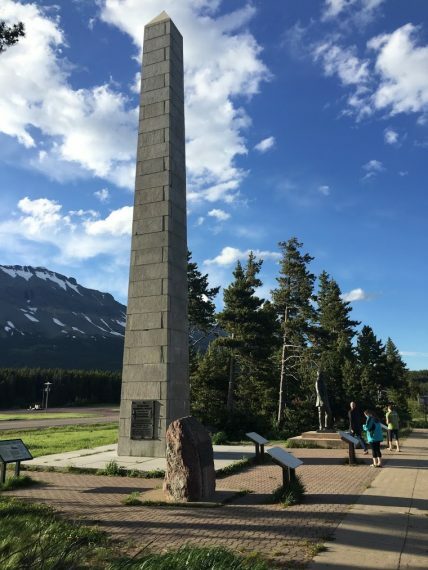 Obelisk erected in 1930 to celebrate Morias Pass connecting the east and west sides of Glacier. 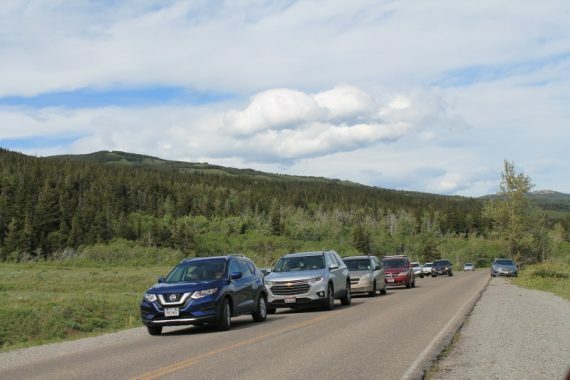 After that unexpected stop, we were excited to get home, but as we passed by Goat Lick Overlook, there were cars parked everywhere and people standing on the shoulder of the road. 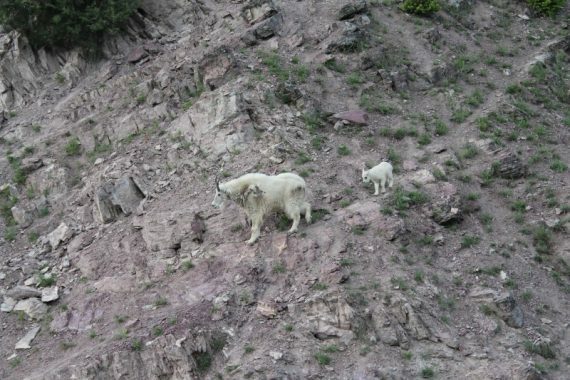 As we drove by, we could see mountain goats everywhere. We pulled the car over and got out to take a closer look. Actually, Mallory and Marissa stayed in the car because they had seen enough nature for one day. 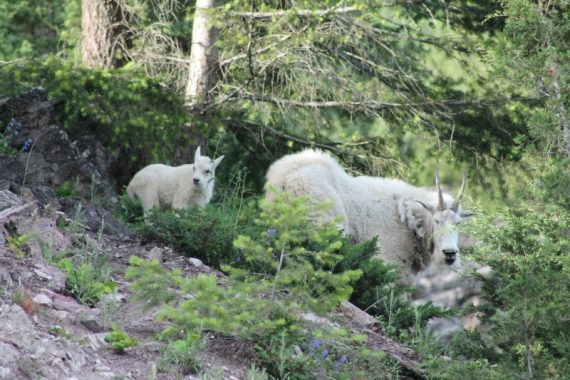 Mommy and Baby mountain goat. 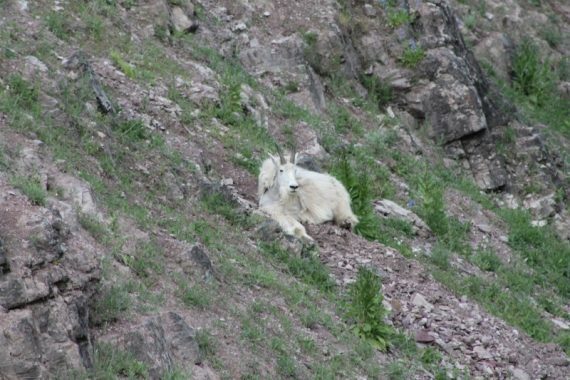 With our mountain goat spotting done for the day, we made it back to the house at 9pm. That made for a 12 hour day! We celebrated Scott & Erin’s anniversary with some chicken fajitas, and they were outstanding, as is everything Erin prepares! Ellery and company had beat us to the house by an hour or two. Ellery did not appreciate the fact we were not there with them. She likes to ask, “Where are my people?” We are proud to be part of Ellery’s people! After dinner, and as people are sitting around doing their thing, PK was on the couch and muttered, “Dangit”. What an outstanding trip you guys are on! It is always good to hear from the traveling kings! I hope everyone’s doing well it looks like you are. We miss you guys and hope to see you sometime in Tulsa. PK wins with quote of the day.